Random Rotating Post Gadget with Excerpt. ~ The Blog Doctor. You are here: Home > Widgets > Random Rotating Post Gadget with Excerpt. Random Rotating Post Gadget with Excerpt. 1. Shows one post title at a time. 2. Links to the post. 3. Shows post excerpt also. 4. Every 5 seconds shows a new post. 5. Cycles through all the posts in the blog. 6. Starts a new cycle at the end of the list. 7. Once loaded continues cycling even when not connected to the Internet. 8. Uses official Google AJAX technology. 9. Can be used on other blogging platforms (not tested). 10. Hovering with mouse cursor over the post title halts the rotation till mouse moves off the gadget. Bloggers with plenty of posts in their blogs face a major problem in showing all of them to the viewers. Some solve this by changing the settings to show all the posts in Main Page. This slows down the loading speed of the blog and can turn away visitors. The Blog Archive gadget which comes as a default with the standard Blogger Layouts shows only the posts in the blog for the present month. The rest of the posts are hidden and can be seen only by clicking the black arrows to expand the archives. This saves the real estate on the blog page but to the new visitor hides the previous months blog posts. One can eliminate the dates in the Blog Archive and show all your posts in a blogger gadget but this makes a very long sidebar and if you have posts with little content this may make the blog seem lopsided. 2. Click Layouts link on Dashboard. 3. Click Add Gadget link in sidebar on Page Elements subtab of Layout tab. Change "MYBLOG" to actual blog subdomain and "BLOG_TITLE" to actual title of your blog. Then paste the modified code in the Html gadget and save the gadget. Get your AJAX API key and put it in above code instead of 'PUT_AJAX_KEY_HERE'. Lastly click and drag the HTML gadget from the sidebar to above the posts column. See picture below. This is because the width of the gadget is more suited for the posts column than the sidebar. Save the Layout. View Blog. If you do not want to save space you can show the whole Table of Contents with post preview. 33 VIEWERS CLICKED HERE TO COMMENT ON THIS POST. ADD YOUR COMMENT. Thanks, just what I need. Is there a way to remove by name and the date of the post in this gadget? 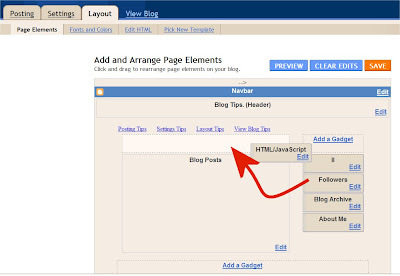 You will need to create a Yahoo Pipe from your blog feed and filter out the name and date options. Then take the RSS feed from this Pipe and paste it in the above code. This is great, but is there a way that this box doesn't change the background color of my original color? Thank you Vin! This is awesome! I haven't got the slightest idea of html and I gave it a go on one of my blogs. I even customized the colors of the thing so it would blend with my background image. IT worked pretty fine with the simple instructions I found here. I used it just to see if I could do it but found it distracting from the blog's content so I took it off. This is pretty sweet. I've modified the script to suit my site, and placed it below my site header. Now there's a large white space between the feed and the body. I changed the margin-top to 0 but I still have a large white space below the feed. it worked it worked! how fun. Once again you've solved a problem for me. I saw this gadget on Usiku's website. Much appreciated. if i have more than one blog site can i put more than one in the random rotating banner, and if so how? Thanks. Have a look at My Blogs gadget on My Gadgets Showcase Blog. How can I get rid of the author's name and post date? just above </style> tag in the gadget code shown in above post. Is there way to get truly random results. It just scrolls from the newest to oldest post in order. And it only cycles through the posts shown at my feed URL. I'm using feedburner so that may be the issue. Because your feed url is added in the code it fetches only those posts. Great tool!! My Problem is, the widget is cutting off my post titles?? Until I see it I cannot see the solution. Go to Settings--->Site Feed---->Post Feed Redirect URL box and delete what is entered in the box. Leave the box empty and save settings. Your feed is not working as it has been redirected to itself causing an infinite loop. Hi Vin, thanx again for your help. I am trying to tweek the code to make font smaller, change font color and to make the background from white to the same as my blog. learning..nay need help later...but the gadget on whole is too wide for the center of my blog. How can I make the width smaller so it fits better..
http://kizzdesigns.blogspot.com Where is the numbers to change for that. Adjust '200' to fit your column. Thanx again Vin, I took widget off as I was playing with it and it turned out oll kooky. and ran out of time to fix. I am trying to find time to work on it again. Will add your new suggestions tough. Also thanx for the site on grabbing a button ... finding time to look at that too. will let you know how it goes. I have this problem: Did everything you said but it just shows as loading. But it still just says "loading"
There appear to be a lot of <br/> tags in the code. Delete the code in the HTML gadget and repaste it without the <br/> tags. DO NOT SWITCH TO COMPOSE MODE. Save gadget. DO NOT USE MS WORD TO COMPOSE CODE. You can use Notepad as it does not insert the br tags. It seems to ahve worked fine for the others, but somehow it just shows up on my blog as Loading... Gadget from The Blog Doctor. I made all the changes you mentioned in the HTML code, but to no avail. I do not see the gadget in your blog. Follow the steps carefully to install it. My issue is that there is a huge whitespace below the gadget. Any help is appreciated. How do I add "Read More" instead of ... ? ?